Gen Xtinct: Is Blythe back? Of all the childhood things I had and lost along the way, there are really only a couple that I wish I had back. One of them is my Dark Shadows board game. And another is my Blythe doll. You remember Blythe, right? She was the doll whose eye color could change when you pulled a string. Blue, brown, and some weird colors like orange and pink were the ones I remember. And she had enormous eyes too, like those Margaret Keane Big Eyes paintings. Did my mom really buy me an original Blythe? Supposedly they were only made in 1972, when I was just 3 or 4 years old. I remember having one, and endlessly changing the eye color, but maybe I am just over-remembering the commercials. Anyway, Blythe vanished from the market, but those of us who had them (or imagined we had them) played with them for years and years. And in 2000, photographer Gina Garan published a photo book of Blythe, "This Is Blythe," and suddenly the doll was remembered again, and a Japanese company started making new versions. But it seems like Blythe could be riding another wave of popularity. Now you can get Littlest Pet Shop toy playsets that come with tiny Blythe dolls. They don't change eye color, I guess, but they have the same giant eyes and are distinctly Blythe. They're seriously adorable though, and I may have to buy one for Kelly. What about you? 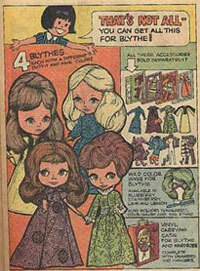 Do you remember Blythe? Did you actually have one, or do you remember the ads?